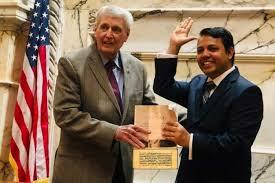 US Delegate-elect Bhandari sworn in - Integration Through Media ....! WASHINGTON DC: Nepali immigrant Harry Bhandari, who has been elected to the Maryland House of Delegates in the United States of America, took the oath of office on Wednesday. He took the oath alongside other elected delegates by touching the Veda, a Hindu religious text. The swearing in ceremony took place at the Maryland General Assembly in Annapolis, Maryland. On the occasion, President of Non-Resident Nepali Association, America Dr Keshab Poudel said Harry’s success is an achievement of the whole NRNA. Meanwhile, Bhandari has said that as the ‘Health and Government Relations Committee’ member he would take initiatives for affordable and sound health care for the residents of Maryland. He has installed the national flag of Nepal and the United States at the place where his secretariat is located. The picture of Sagarmatha (Mt Everest) and Nepal’s national flag have also found place in his office.